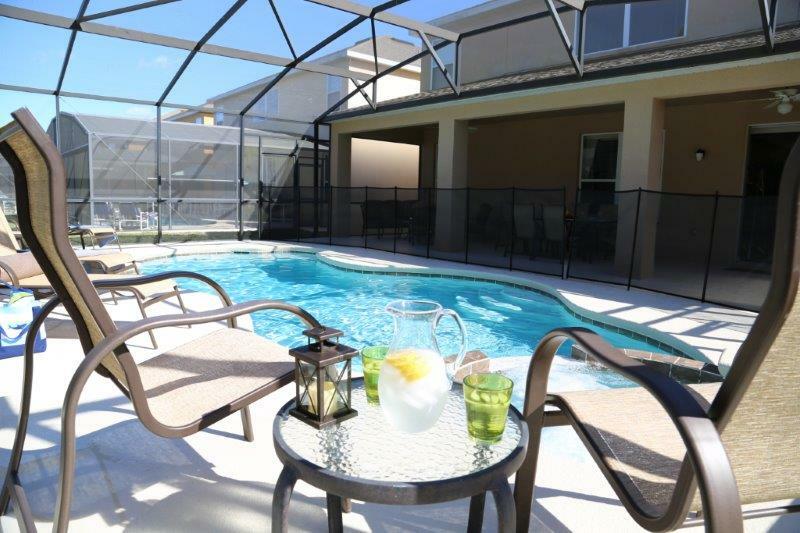 Our Orlando Villa has been fully renovated and is a luxurious 6 bedroom 5.5 bathroom house located in the Watersong Resort with an over sized pool, deck and spa, giving you that true resort feeling. Ideal for guests who are looking for something special, with a touch of luxury and elegance. The Villa Orlando has been designed internally by a leading interior designer and can accommodate 12 guests with ease. There is complementary WIFI through out the house and a printer / copier / scanner. FREE local and international calls are also included. A large informal sitting area, over looking the pool, with a stunning high ceiling. 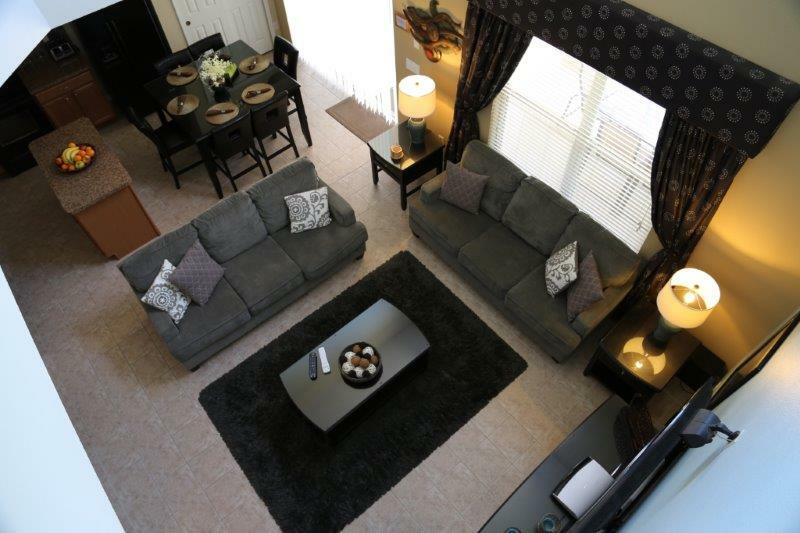 The family room is open plan to the Kitchen, Nook, Dining Room and Lounge. 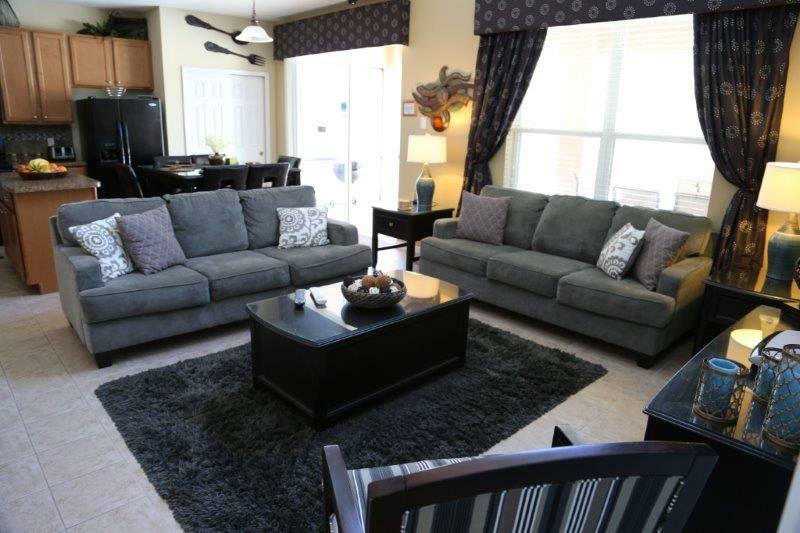 This is the ideal area to sit relax and watch our 50" flat screen TV with a BOSE 5.1 surround sound system with DVD, CD, Blue-ray / PS4 player and cable TV. There is also a library of DVD’s and PS4 games. An altogether stunning audio experience. Our well equipped modern kitchen contains every thing you will need for you stay from a cooker, microwave, dishwasher, fridge, freezer with built in ice and chilled water dispenser along with all the other essentials such as cutlery, crockery and glassware and most of all the bottle opener, there is also a i-dock with radio, so no need to bring the charger for your ipod. 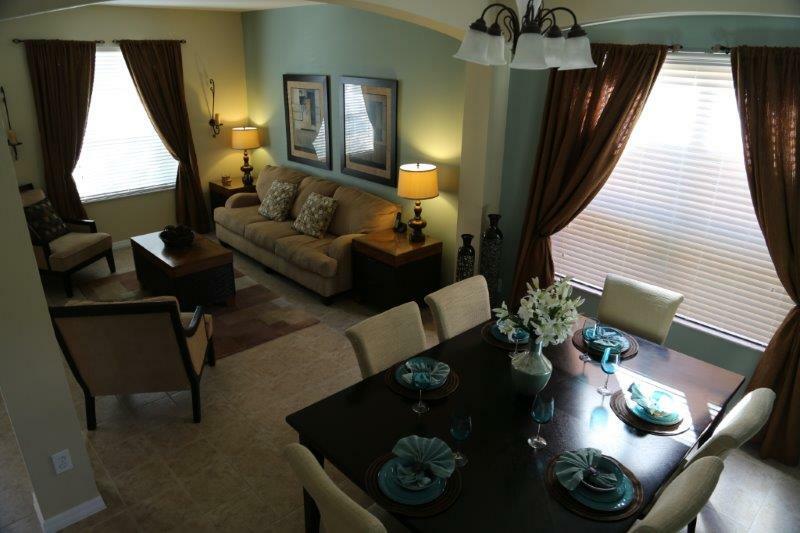 Leading on from the kitchen is an informal dining / breakfast area with a table and 6 chairs. 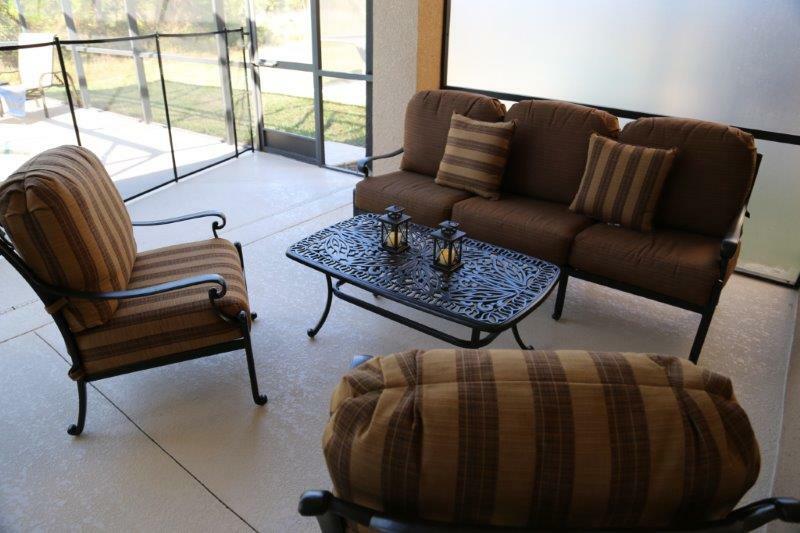 From the nook area you can exit through the patio doors onto the covered lanai and pool area. This over sized 10x40' area gives you the perfect protection in the summer and has 2 ceiling fans to keep you cool and a dining table and 6 chairs plus 2 additional easy chairs and a sofa. 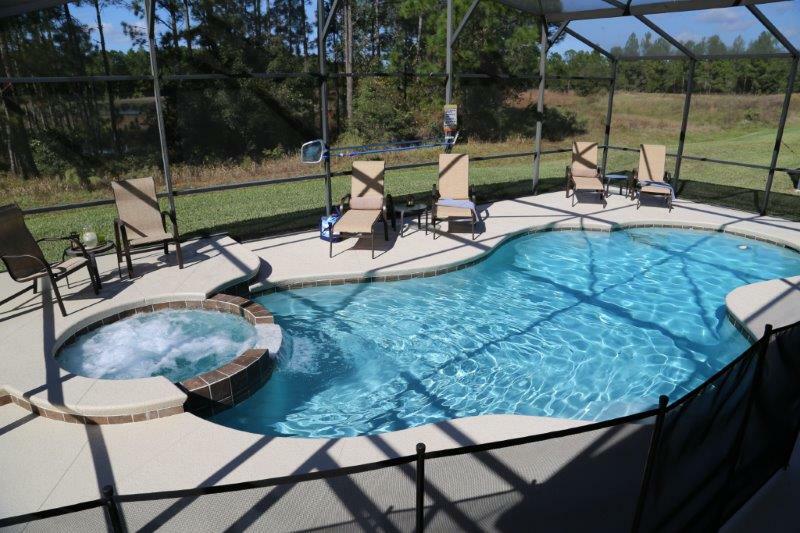 Our over sized 15x30' pool is set in a resort style extended deck which has 4 luxury sun loungers each with a drinks table and is complemented by the spa which has and additional raised seating area with 2 chairs and a table, the perfect spot to relax and refresh yourselves after a long day in the parks. The pool area benefits from a hot and cold outdoor shower. The external area is fully screened and has a safety fence for children around the pool. To keep you entertained we have located a games room in the garage area. 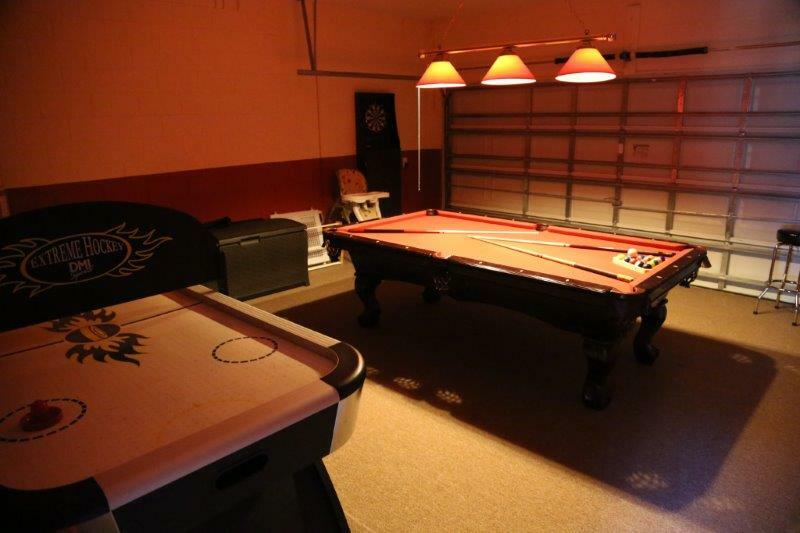 Including a slate-bed pool table, air-hockey, darts, flat screen TV with cable, high drinks table with 2 stools and ceiling fan. 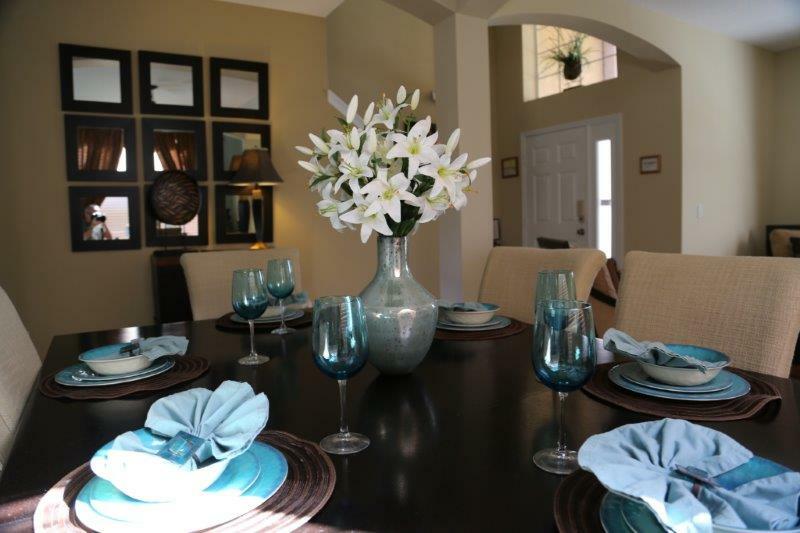 Located just off the kitchen and family room our formal dining room contains a beautiful table with seating for 6 people. Our formal lounge located next to the dining area has 1 large sofa, 2 chairs and offers that ideal area to have a quiet moment to yourself or a place to escape and relax in the luxury of the surroundings, there are also some board games. Well equipped with a washing machine, tumble dryer, vacuum cleaner, iron and ironing board, high chair and travel cot. 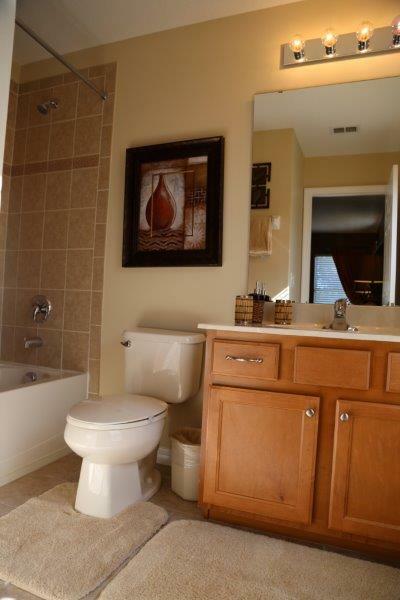 Located off the family room with WC and basin. 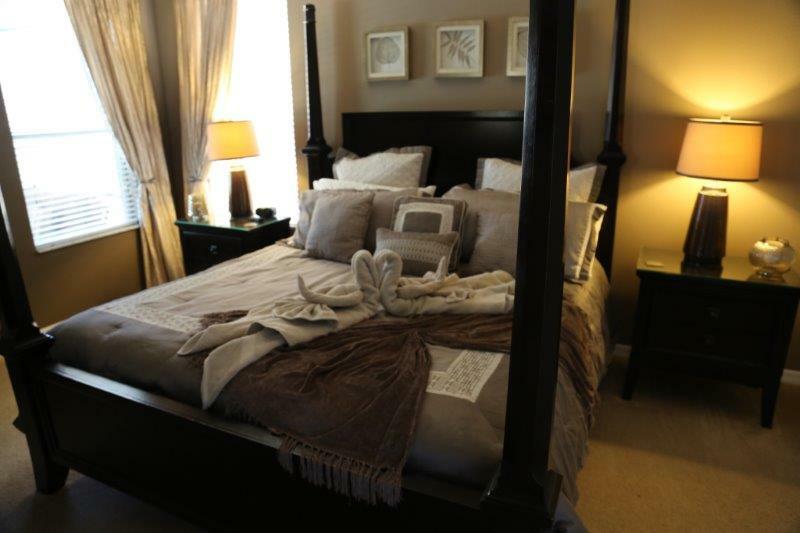 A huge luxurious 4 poster king size bed sets the tone for this stunningly furnished and decorated room. 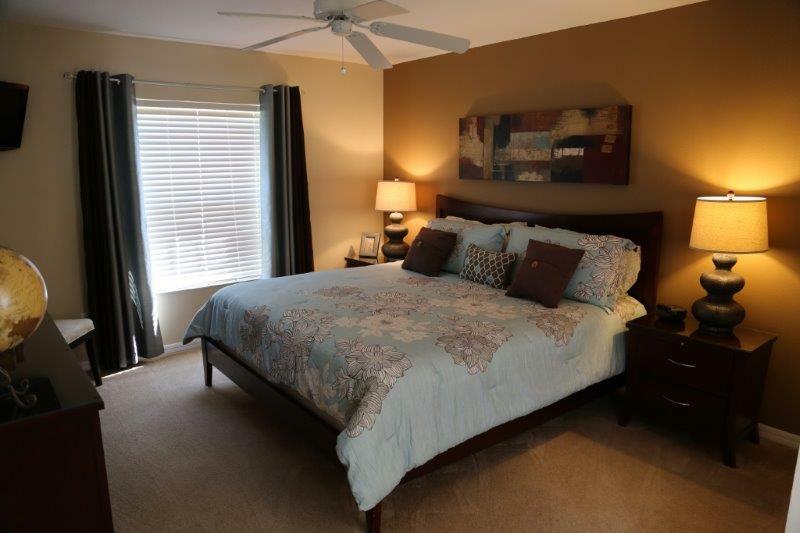 Our master bedroom also boasts a LCD flat screen TV with cable TV and DVD / CD player, clock radio, bedside telephone, ceiling fan and a large walk-in closet. 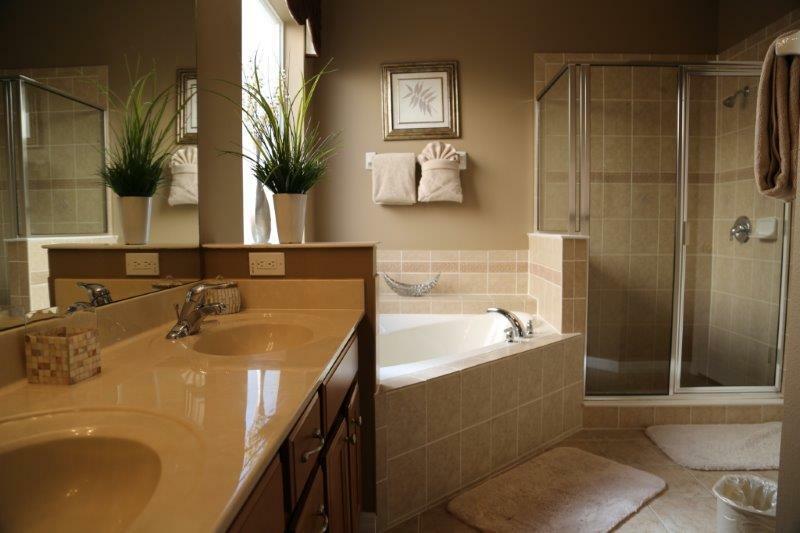 A stunning spacious bathroom with double vanity unit, garden tub, over sized walk-in shower, WC, bathroom scales and hair dryer. 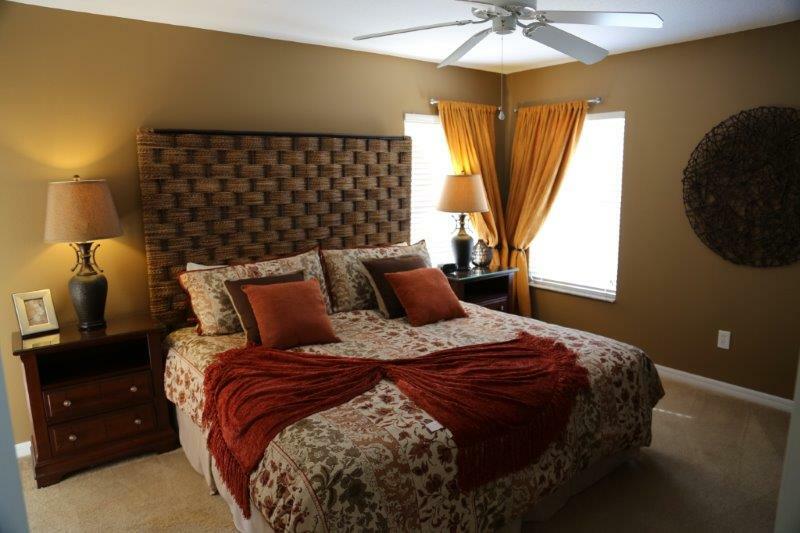 A huge luxurious king size bed sets the tone for this beautifully furnished and decorated room. Our 2nd master bedroom also boasts a LCD flat screen TV with cable TV and DVD / CD player, clock radio, ceiling fan and a large built in wardrobe. 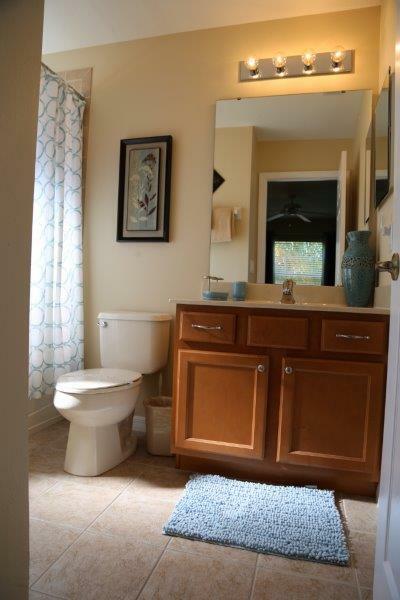 A bathroom with vanity unit and dressing table, bath and shower, WC and hair dryer. Another luxurious king size bed sets the tone for this tropical themed furnished and decorated room. Our 3rd bedroom also boasts a LCD flat screen TV with cable TV, clock radio, ceiling fan and a large built in wardrobe. 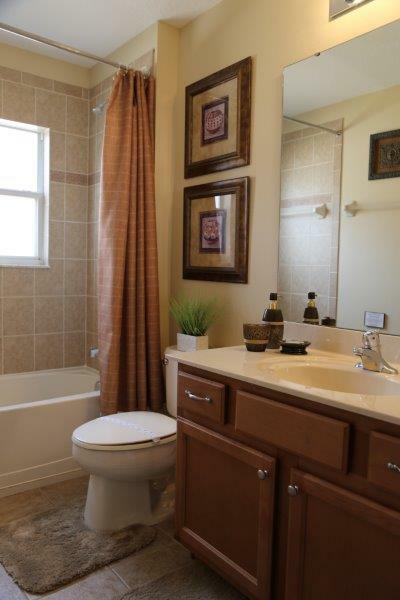 A bathroom with vanity unit, bath and shower, WC and hair dryer. 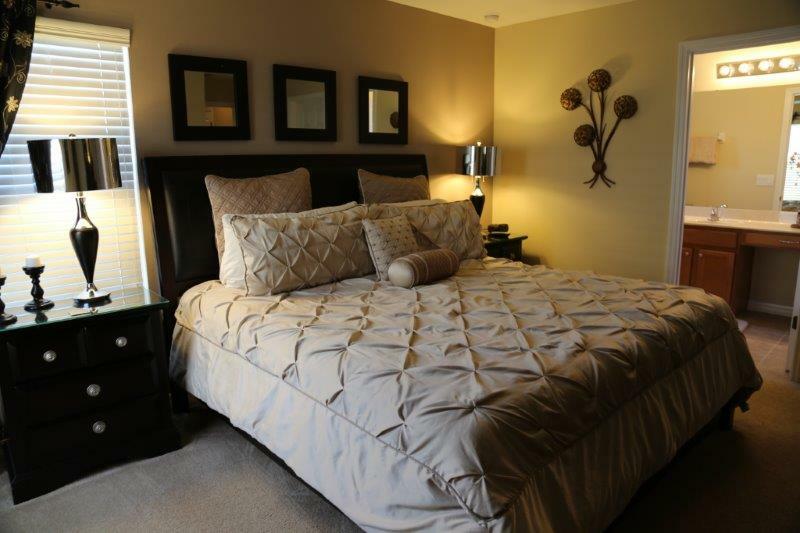 Yet another luxurious king size bed sets the tone for this furnished and decorated room. Our 4th bedroom also boasts a LCD flat screen TV with cable TV, clock radio, ceiling fan and a large built in wardrobe. This twin bedroom has a Pirate theme. 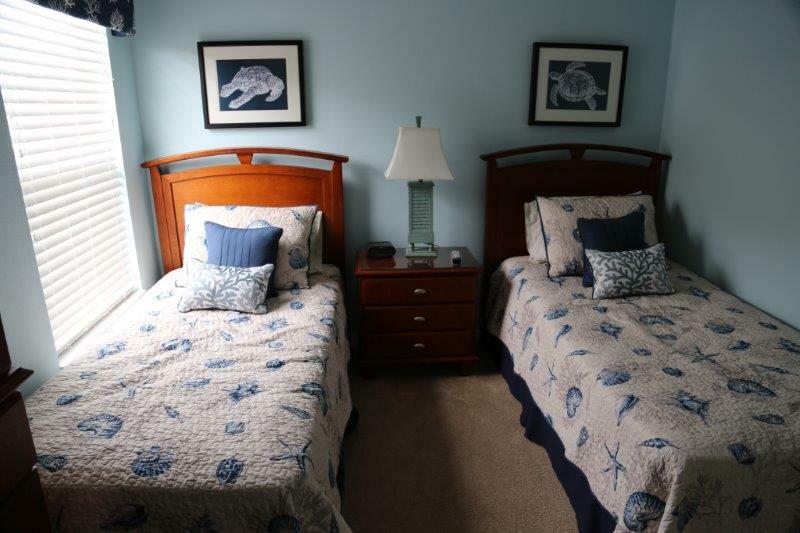 Our 5th bedroom also boasts a 19" flat screen TV with cable TV, DVD player, clock radio and ceiling fan. 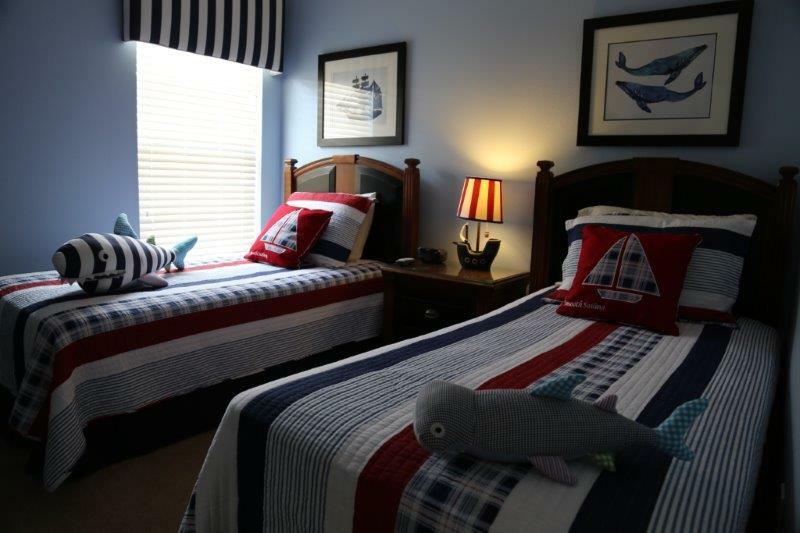 This twin bedroom has a Nautical theme. Our 6th bedroom also boasts a 19" flat screen TV with cable TV, DVD player, clock radio, ceiling fan and a large built in wardrobe. Desk with chair and colour printer / copier / scanner. We really enjoyed the vacation and the use if this spacious property. Great Job! This was a perfect home away from home! Enough room to spread out. Nice pool & hot tub! We went to Universal, Disney, sea World, shopping at the Preimum Outlet Mall all was within 20-30 min drive. My only complaint was I think the beds could be replaced, we were in the downstairs master & the bed was terrible, but over all the house was great! We had a fabulous vacation. Thanks! We never met the manager or owner. We are glad you had a fabulous vacation and stay and we will get our management company to check the bed in the downstairs master and replace if necessary. Only 25-30 mins from most of the parks. 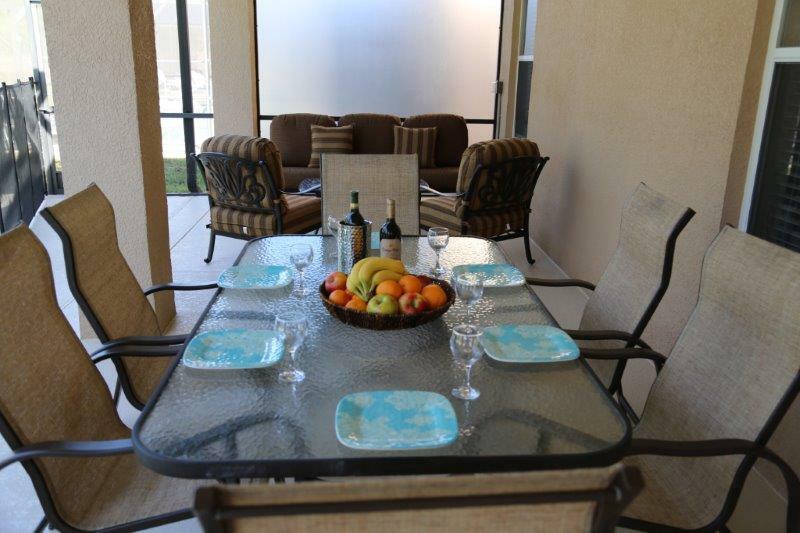 The property was clean and well equipped. If you have any concerns or queries you can call the customer services team. We didn't use the communial pool and it would have been useful to have an onsite shop but I'm being picky. 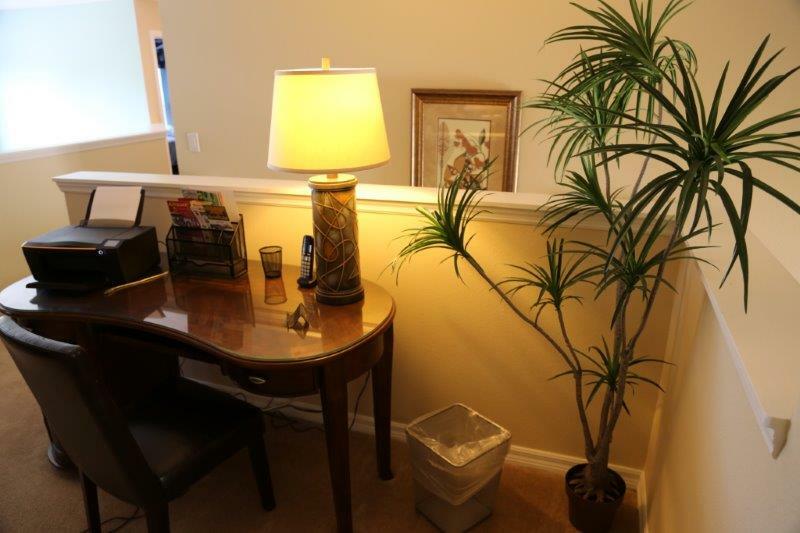 Overall great location and excellent property. Our group has stayed at this home several times. The ladies request it. The location is perfect for the activities we enjoy. 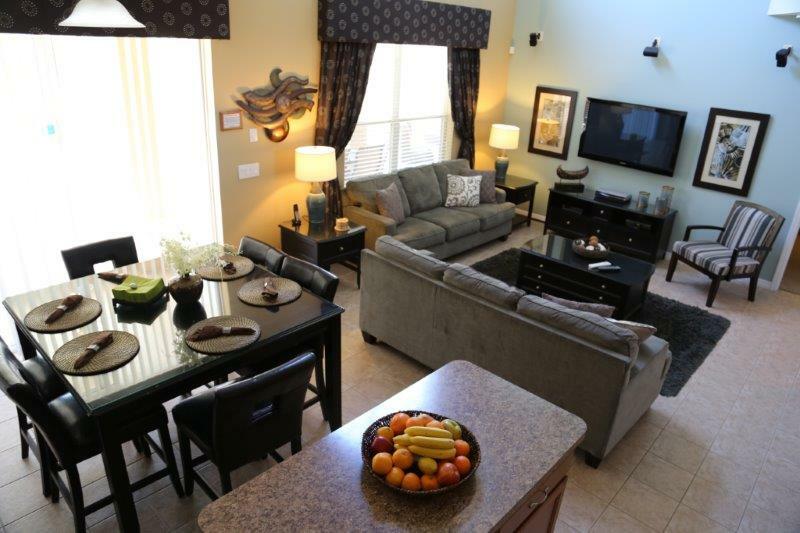 It is quiet and peaceful in Watersong. 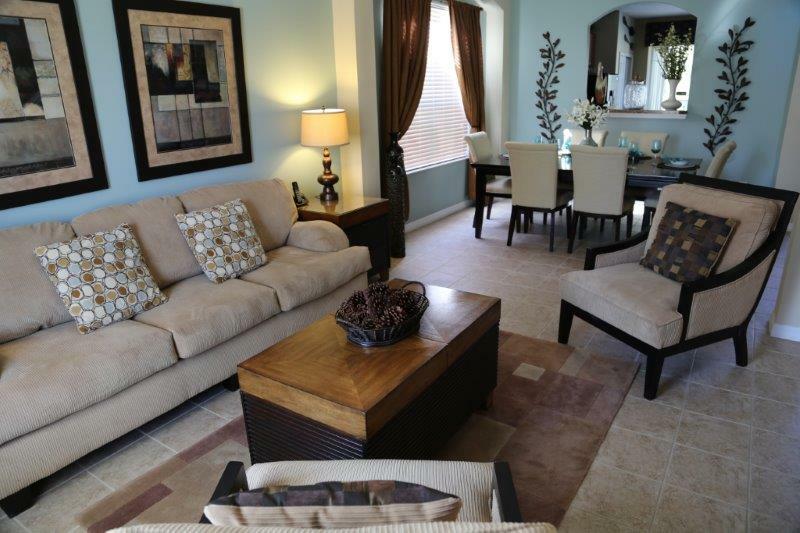 The home is always clean, well stocked with dishes and towels and everything was in good working order. 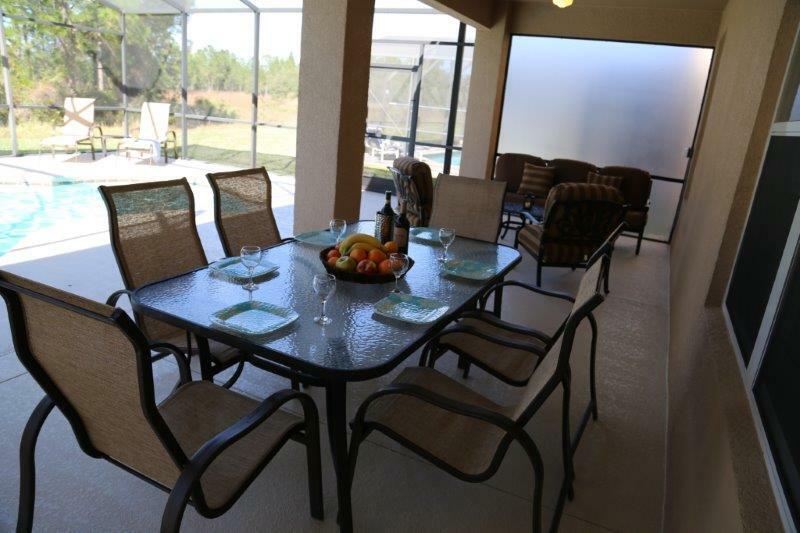 Our only request was maybe putting a handle on the sliding glass door to the pool. The fingertip grip was hard to manage for some of the older ladies and the younger ones broke a few nails. We highly recommend this house for location and for condition. We will return. Thanks for a wonderful vacation. 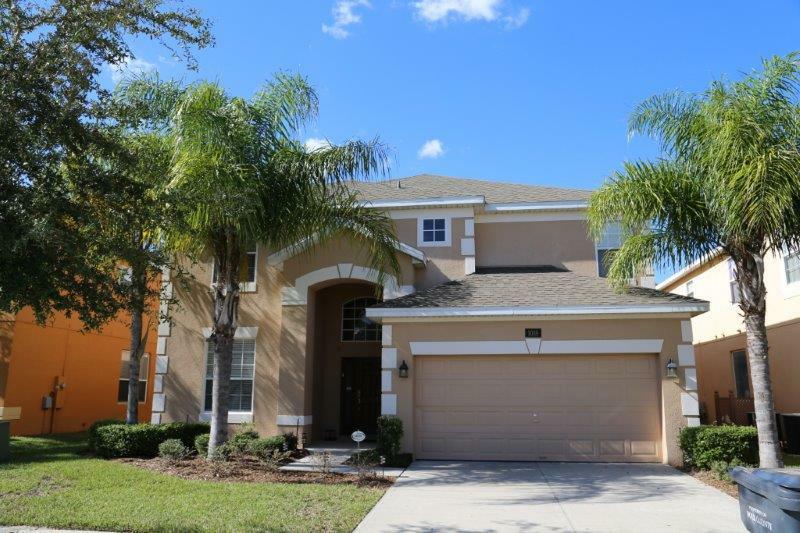 Amazing home, beautifully decorated, well equiped, excellent location what more could you ask for. The owners were always there to help anytime I had a question. The Villa was better than we could of ever imagined and will never stay in another hotel room again! We will look forward to another stay in the future, thank you! Stunning villa, An amazing holiday destination. Back as soon as poss !